Our mass flow meters handle more problem fluids than anything else in their class. Changes in density, pressure, temperature, viscosity, or flow profile have virtually no effect. 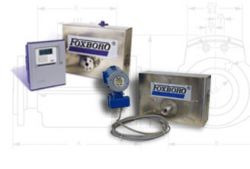 The Foxboro coriolis flow meter delivers highly accurate, direct measurement of total mass, volume mass, and concentration of dissolved substances. They are your meter of choice to measure the mass of conventional liquids plus non-Newtonian fluids; viscous, abrasive, and shear-sensitive fluids; slurries; and liquefied gases.